Backed by a who's who of old-guard Washington musicians, Hodge presents a sweat-inducing set of house-rockers that cover the R&B landscape, including the rollicking 'Elmo's Blues,' the jumping 'I-Re-Peat' and the Little Featish 'To the Left.' `Dave Nuttycombe for the Washington City Paper. If you wanted to come home from work, take off your shoes and sit down in a Lazy Boy to the Eyewitness Blues - here it is. 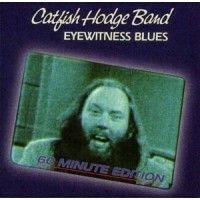 The Catfish Hodge Band has released the 60 minute edition of Eyewitness Blues, but don't sit down yet. This GENES CD compilation of two previous Adelphi Records sessions is a party CD waiting to happen. All except two cuts are originals and Catfish does write some good material. His band turns in a credible performance, but Catfish's vocals definitely lead the group. Some of the highlights include 'Cold, Cold' and 'Record Executive Blues', which features a great harp solo from James Cotton. The disc features solid guitar solos from Jimmy Thackery. ~Dean Barker, radio consultant, writing for Blues Review.